A PAINTING of great significance to Helensburgh is currently on show in the Anderson Trust exhibition at Helensburgh Library in West King Street. The enigmatic rear view portrait has been arousing interest and comment from visitors, and the importance of this painting to Helensburgh and to this collection of paintings cannot be overestimated. Not only does it have strong local connections through artist, subject and setting, but also it calls to mind two notable artistic families and a whole period of vibrant artistic activity in this area at the turn of the twentieth century. 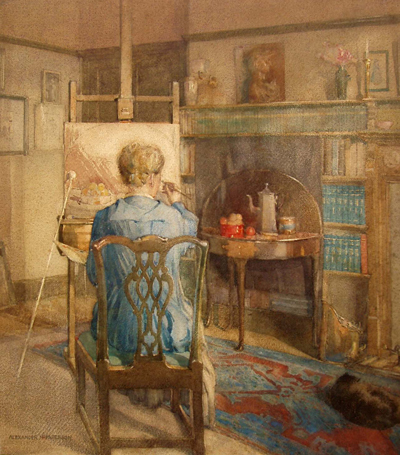 The portrait is of Maggie Hamilton at her easel, painted by her husband, the architect and artist Alexander Nisbet Paterson, and it is a particularly fine example of the artist’s skill as a watercolourist. In the current exhibition the portrait forms a fitting companion to another large watercolour, A.N.Paterson’s 'Prelude to Spring', recently donated to the Anderson Trust, which hangs beside it. The Trust owns four other paintings by A.N.Paterson — all landscapes — and these recent additions, so different in scale and subject, help to demonstrate the scope of the artist’s talents. What makes them even more important for a Local Collection such as this is that they depict different aspects of the artist’s own home, the Long Croft in West Rossdhu Drive, designed by him in 1901. Design elements of the interior are clearly evident in the background of the portrait painting and have been preserved to this day by the present owners of the Long Croft. Likewise, the woodland garden sloping down to the stream in 'Prelude to Spring' bears a strong resemblance to the garden as it is today. Maggie Hamilton (1867–1952), the subject of the portrait, was the daughter of James and Mary Hamilton, whose home, 'Thornton Lodge' on Sinclair Street, became the focus for a number of Glasgow artists in the late 1800’s, among others, James Guthrie, E.A Walton, Alexander Paterson and, of course, their son, the artist, J. Whitelaw Hamilton, who was one of the first members of the Glasgow Boys. In this environment it was not surprising that Maggie Hamilton also studied art at Glasgow School of Art and became noted for her very fine embroidery. It was she who was largely responsible for the interior design of the Long Croft, in particular, the remarkable embroidered floral over-mantel panels which testify eloquently to her artistic skill. She commissioned from her daughter. Viola Paterson, who also studied art, a set of three stained glass windows for St Bride's Church commemorating her family — Maggie’s parents and her aunt). Thanks to the efforts of the Helensburgh Heritage Trust these windows have been preserved and can be seen, mounted as panels, in Helensburgh Library. 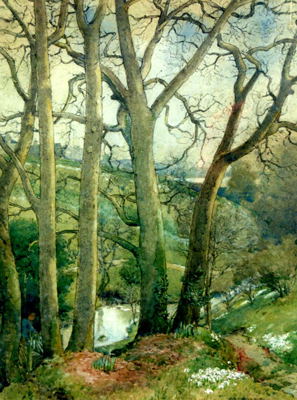 Alexander Nisbet Paterson (1862–1947) belonged to a family with a strong artistic tradition, which in fact extends beyond his lifetime over a further two generations, numbering seven practising artists in the family to date. Alexander was the younger brother of James Paterson, RSW, PRSW, RWS, a notable painter and founder member of the Glasgow Boys. Although recognised as an accomplished watercolour painter and member of the Royal Society of Watercolourists, Alexander Paterson trained and is better known as an architect. 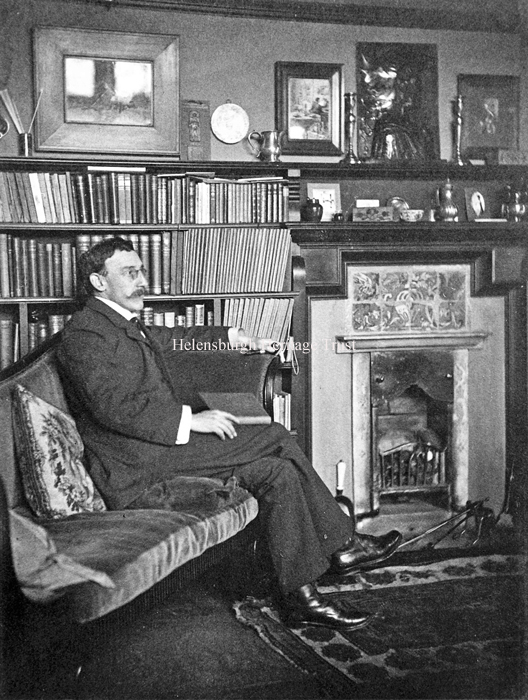 He lived most of his life in Helensburgh where he is remembered for the design of a number of public buildings including Clyde Street School and the Hermitage Park War Memorial. In 1897 he married the artist Maggie Hamilton, and it was in the Long Croft, the house which he designed as their family home, that both could give unbridled expression to their artistic talents. This, then, is the setting for the two watercolours on display until the beginning of July. The Anderson Trust trustees are always glad to receive comments or information about the paintings and artists in the Collection. 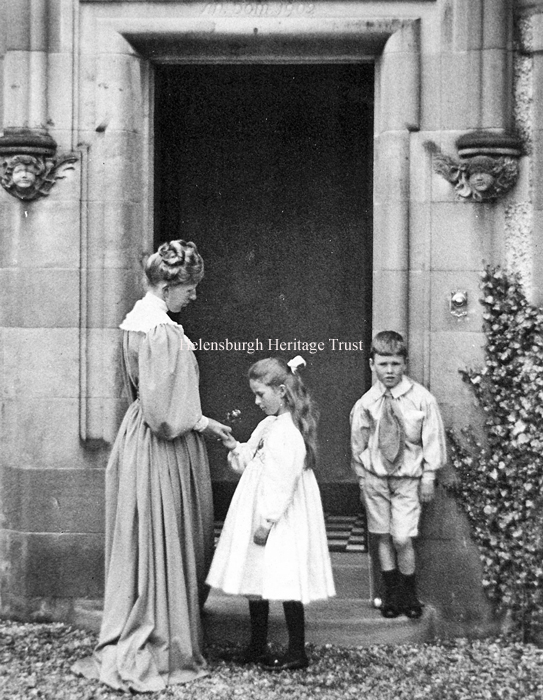 The pictures on this page are 'Portrait of Maggie Hamilton' by her husband, Alexander Nisbet Paterson; 'Prelude to Spring' by Alexander Nisbet Paterson; a photo of Alexander Nisbet Paterson in his study in the Long Croft; and a photo of Maggie Hamilton at the front door of the Long Croft with her children Alastair and Viola Paterson.